Mungiki member, Agabo is a Kenyan ork. 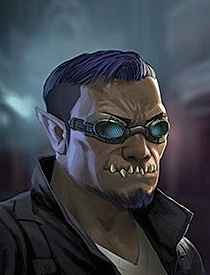 He provided some street security around the undercity church that sat above the insect hive, while the team raided it, after trying to rob HCB and being intimidated by his Yakuza tattoo and gruff demeanor. Back on Earth recently, settling in Lagos.